Most of the rumors about Apple's upcoming product launches have swirled around the iPhone 6, which will reportedly have near-field communication capabilities. But today, a report from the Wall Street Journal claims that the soon-to-launch iWatch will also feature NFC, allowing your wearable to act like your wallet. And there's more. 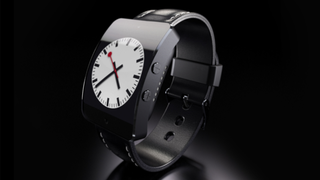 The smartwatch would be offered in two sizes, both featuring a curved organic light-emitting diode screen, those people familiar with the device said. It will include sensors to track and monitor health and fitness data, the people said. Unfortunately, it seems that the rumors suggesting the iWatch is nowhere near ready to ship are true, too. The WSJ says that though Apple will introduce the device at its September 9 launch event, and may take pre-orders for the watch, there's no word on when it plans to actually ship them. By waving a device in front of a reader, NFC could potentially be used in place of transit tickets, to turn on lights, sync devices to automobile in-dash display software or to download information about artworks at a museum, among other uses. The Clarion hotel chain has tested NFC as a replacement for room keys.